Following on from the usual tired old grumpy pro-road editorial in the Dom Post, which came to the conclusion that pursuing Option X would be a waste of time, perhaps it is time for a less jaded eye to look at the arguments for, and against. First up, and to some, most importantly, i guess that we have to address the question of cost. The DomPost identifies that Option X may cost up to $165m, which does sound like a heck of a lot of money, and says that the “agency’s preferred option” would only cost $75m. Well, that’s a slam dunk right there, isn’t it? One option more than twice as much as the other? Those damn pesky architects proposing being profligate with the public purse? Except that, no, i reckon that the Dom Post figures are wrong. Both NZTA and the Arch Centre have released price estimates, which include a contingency for cost over-runs. The DomPost has committed the most basic of errors, taking just the lowest base price for the NZTA scheme (with no contingency), while they have put that against the highest possible price for Option X (including a contingency). That’s the sort of error that you would fail in maths for at the most basic of elementary schools – for the Dom Post to make this mistake shows just how little attention they pay to journalistic integrity. The true figures would surely be to compare the costs on both sides, without the contingency. That is $75m vs $130m. But, hold on, there is more. Remember that sneaky pro-cricket councillor John Morrison, who secretly held a metaphorical gun to the head of Transit, and secured an agreement that a new Grandstand, priced at $11m, would be the price to pay for his pro-road guarantee? If there is any truth in that, then you have to add on another $11m to the option A costs, bring the basic scores to a $86m vs $130m. So – apart from possible sky tunnels suspended from sky hooks, the next thing is to ask what you get for each scheme. Certainly, Option A gets you flyovers. One big one, (or possibly two) leaping off into space just near the Mt Vic tunnel, or rather, immediately outside the window to the catholic church of St Joseph. It then spans it’s way gloriously above the traffic around the Basin, arguably ruining the ambience of the cricket ground below, and lands delicately on the hillside behind the Vance stand, where it then proceeds to drive through the middle of the National War Memorial and ruin the ambience there as well. To be honest, it really does not sound like a terribly well thought-through scheme either, and the capital gets the worst of both worlds – a buggered Basin, and a pretty pathetic hash job of a Memorial Park as well. Oh, and the inevitable increase in noise to the whole nearby residences of Mt Vic as well, and no perceivable solution to the issue of numerous school children crossing the roads around the Basin, all of which stay in place. Really, apart from speeding some cars from the Airport, who will just get minutely faster to the next set of traffic lights at Tory St, and then another set at Taranaki St, there does not seem to be that many advantages in doing this. Everyone in the Government, apart from Stephen Joyce it seems, understands that really the best thing to do with the Memorial Park would be to bury the road, and give a little respect to the war dead. There is almost a tacit understanding that this needs to be done, and probably this will indeed be done one day at some unspecified time in the future, perhaps when we are a bit more grown up as a country. In the mean time, we will have a War Memorial with NZ on one side, and the Aussies, the Brits, the Yanks, the Japanese etc all having little clumps of memorials on the other side of a 3-lane State Highway. Diplomats are far too diplomatic to say so, but word on the street is that they are all rather appalled by the crassness of the proposal. So if you add in the likelihood that one day, the Memorial Park highway will eventually be put underground, and look at the costs again, what do the true costs look like then? Option A, the “cheapest” of the two flyover options, then looks like it will cost a minimum of $86m + $75m ie at least $161m in today’s money – and of course, that figure does not include any contingency. Compare that figure therefore, with the reported $130m for Option X and now you start to see that in reality, and taking into account the likelihood that one day the nation will accept the inevitable that the State Highway should not go through the National War Memorial, then Option X is now the cheapest of the options – or shall we say, the best value. Because doing this properly is never going to be cheap. But wait, if you think about it, there is more. 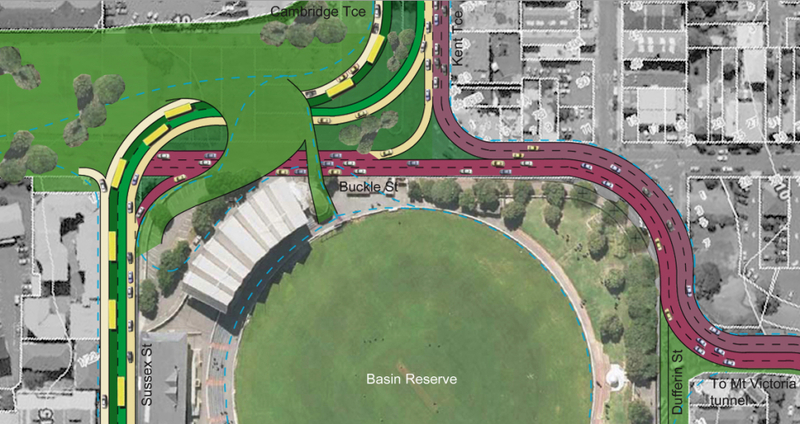 As far as I can see, the Option X plan is the only one to actually offer the city anything extra – it plans the road to Adelaide in such a way that the old massive roundabout around the Basin is gone, and new parks are created on the east side, in front of the schools. For land locked / asphalt girded schools such as St Marks, Wellington East, Wellington Girls etc, surely that availability of extra land etc must be worth it’s weight in gold, as a place for school children to not have to be stuck in a circle of cars and roads? By comparison, Option A and Option B just appear to offer the public the choice of sitting under a flyover, with cars and trucks roaring overhead? So, effectively, we have positive urban benefits vs negative urban benefits, and how do you put a price on those? Could we actually have a situation where Option X gives a net positive result back to the city, in the form of the enhanced urban / greened footpath connections it makes through the city, vs a straight out costly roaring only solution such as Option A? Is it possible that the Council and / or the Government could see beyond blinkered eyes, and promote that Wellington goes for something positive here at last, instead of the inevitable crass roaring only solution? Wait and see: Council decision is due today. Sadly Councillor Morrison’s grandstand is more an indication that he is pro-car, rather more than he is pro-cricket. This sop to our intelligence is simply an attempt to silence his (many) critics. In defense of the terminally lazy Dave Burgess at the Dominion Post, he’s simply repeating the numbers supplied by the NZ Transport Agency’s Rod James – who is coming up with figures for Option X that have all the credibility of a dodgy finance company’s prospectus. It’s really disappointing to see a public servant putting out disinformation like this. He’s supposed to be neutral and assess the different options on their merits, but instead he’s spinning like a third-rate PR flack, and putting apples-v-oranges comparisons into the public domain in a way that is intended to mislead. So much for the vaunted public sector code of conduct, I guess. And Dave Burgess, bless his little cotton socks, is simply repeating them verbatim. Whether this constitutes effective reporting – “telling truth to power” – from our daily paper of record is left as an exercise for the reader. I’m still wondering about Option X’s missing turns. How is west bound traffic coming out of the tunnel supposed to turn north on Cambridge Tce? Surely it isn’t supposed to wait for a north bound turn until Taranaki St? And is north bound traffic coming from Newtown supposed to throw a U-ey on Cambridge Tce in order to visit the eastern suburbs? Until these questions are answered, Option X is incomplete… like a building design where the architect has forgotten to include exterior doors. Plus, I really don’t get the anti-flyover obsession. Plenty of cities have these, including Wellington. They’re no big deal. Steve Newtown really needs its own KFC. Looks like there’s been some positive news from the Council, or depending on how you read it maybe not. DomPost reports they’ve voted 8-7 to include a tunnel from Patterson St under the Basin Reserve to Buckle St as the preferred option (something along the lines of Option F/G I suppose). But as their fallback option they’re supporting the flyover — so since the tunnel won’t get funding I suppose the cynical will say they council is defacto supporting the flyover. Also they’ll ask NZTA to bring forward the Mt Vic tunnel duplication. If they do get both tunnels that 600-700 million of spending and still between The Tce and Mt Vic we’ll have only buried a quarter of the traffic (half of the westbound flow).